From 1st October 1979 to 31 December 1983, Sam Onunaka Mbakwe was Governor of Imo State (what is today, Imo, Abia and Ebonyi States). History validates him as one of the greatest leaders to emerge from the Eastern part of Nigeria. The name Mbakwe is synonymous with charisma, performance and activism, so much that the press nicknamed him, “the weeping Governor” for consistently arguing against the neglect of his state by the Federal Government. He was always advocating for his people. Mbakwe without a doubt made fine imprints in his time building several roads, industries, a state-owned university, etc. The Imo Modern Poultry Complex, Avutu, the Aluminium Smelter Company, Inyishi, the Amaraku Power Station, Imo state University and Progress Bank are some of his legacy projects. Eket Stadium is currently under construction in fulfillment of Governor Emmanuel’s campaign pledge. The artificial Turf and all modern fittings needed to build the Eket Stadium and revamp the Uyo Township Stadium have been delivered and received by the State government. Governor Emmanuel has built a sports complex at West Itam Secondary school opposite the NNPC Mega station along Uyo Ikot Ekpene Road. 9 more to go. The female team of Akwa Ibom State, Ibom Angels made it to the FA Cup final and finished second, which is tremendous improvement on her past records.Nothing is too small if we tell our friends that Akwa Ibom State can boast of one of the best road networks in the country. Governor Udom Emmaniel is currently undertaking the construction of over 50 roads in the Uyo metropolis and environs. Akpaube Close, Akpa Ube Lane off IBB Avenue, Ekperi Close by Akpaube, Idak Ukpa Street, off Aka Etinan Road, Afaha Atai village crescent road, in lbesikpo Asutan Local Government Area, Vision close in Nsukara Offot, Udotong Ubo Lane, Akparen Street, Nung Atai Street leading to Christian Secondary Commercial School, Ibiono Lane, Unit D line in Ewet Housing Estate, Ediye Samuel Street, off Edet Akpan Avenue, 12.Akpan Ndem Street by Ewet Housing Estate, Unit G Line in Ewet Housing Estate, Eden Udo Close, roads around Atan Offot from Aka Etinan to the back of the State Secretariat and another spur to Goodluck Jonathan Boulevard, Ring roads 2 now wear a new look. Nothing is too small if can at least acknowledge the several road projects Governor Udom Emmanuel is constructing to open up the state. The 4.6km School of Arts and Science Road Nung Ukim Ikono has been completed with side drains and is ready for commissioning. The Gully Erosion that threatened to completely destroy the major access road linking Ikono and Ini has been arrested by the Udom Emmanuel administration. The 19.3km Anua Mbak Ishiet road in Uruan traversing 7 villages including, Anua, Ifa Ikot Okpon, Mbak, Ikot Otoinye, Ekim Enen, Adadia, and Ishiet is progressing and the 4.0km Mbiatok – Ekritam – Mbiaya Uruan road, criss crossing Ita Uruan, Ikpa and Mbiakong villages is steadily advancing. The 8.5km Nduetong – Oku Ibiaku Uruan – Ekritam road with spur to Ini Uruan, that passes through the Uyo City Polytechnic to Planet FM 101. 1 premises is in the works, valuation of property that will be affected by the road is ongoing and sorting this out to enable compensation payment to owners will eventually get the project on course. Development is not a tea party. 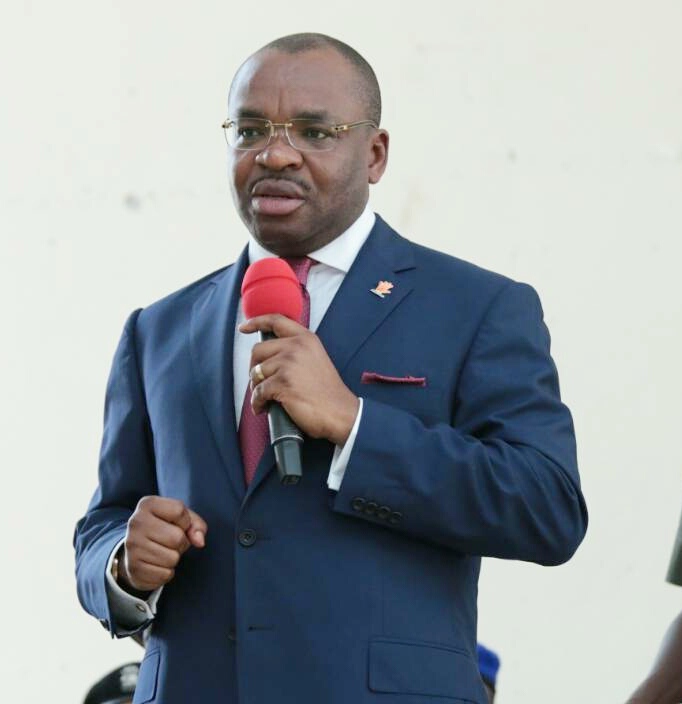 No Governor in the current class can stand shoulder-to – shoulder with Governor Udom Emmanuel for roads constructed amidst the terrible economic recession Nigeria is enmeshed in. Governor Emmanuel’s administration is currently building five dualized roads to completely link up the entire State. Nothing is too small if we tell the world that the dual carriage 20km Ekom Iman – Etinan road traversing Ikot Oku Ikono – Asuna, Ishiet Erong, Afaha Iman, Etinan Urban to the roundabout by Etinan Institute. Then the next stretch of 29.0km Etinan – Ndon Eyo road, also dualized, extending through Ekpene Ukpa, Efa, Mbioto, Ikot Oku Ekanem, Awa, Mkpok to Ndon Eyo. Let’s talk about the dualization of the 14.5km Uyo – Oron Road (Airport Road – Okopedi Oron – Oron Road by East West Road) cutting across Ekpene Ukim, Ikot Asua, Ikot Etieidung, Nung Atai Eta, and Okopedi Okobo in Nsit Atai and Okobo Local Government Areas. There is also the 13.5km Okopedi Okobo – Oron Road proceeding from Nung Atai Eta, Itak, Uyatie, Edeghi Awa Ikpi, Otti Oro and Uya Oro villages in Okobo and Oron Local Government Areas.